Amidst the much hullaballoo, Udtaa Punjab has finally hit the screens with a hype that’s unusual for a Shahid Kapoor starrer. 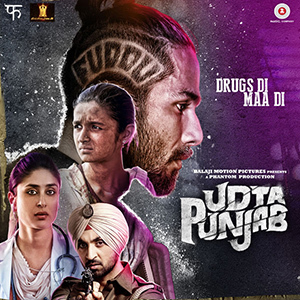 The movie unveils in a very interesting scene where a drug dealer from Pakistan throws a packet like a discus throw into a field of Punjab, and the title appears UDTAA PUNJAB. 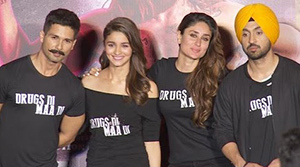 The film primarily deals with the drug menace in Punjab which is happening at a huge scale. It takes the help of four characters to showcase the situation and what happens to the people related to it. Gabru aka Tommy Singh is a rockstar singer, who has an insane following among the youth. He became a star at the age of 21 and there was no looking back. He was into drugs at a very early age and his songs also revolved around getting high. The lyrics of his songs became a philosophy for his fans, where they can do anything for the drugs. He is their role model. Such a dangerous role model that a young lad even kills his mother for not giving the money for drugs. Gabru’s career starts sinking when his inspiration (the drugs) starts making him go out of his mind. His business deals get broken and he also gets caught in a police raid on his birthday party night where he is drowning in drugs. On the other hand we have Preet (Kareena Kapoor) a doctor who is a specialist in rehabilitation of the drug addicts. On of her patients is brother to an A.S.I Sarjit. Sarjit works mostly at checkpost and earns a good amount every other week for letting go the drug trucks into the town. He is least bothered about the effect until he learns that his brother became a victim of that. Sarjit feels guilty and starts working with Preet to get the information of the people behind the whole drug kingdom. Another important character of the film is Alia Bhatt, who is actually a hockey player, but turns to labour as a result of poverty. She ends up getting into the hands of drug dealers. She is forced to drugs and they push her into prostitution. 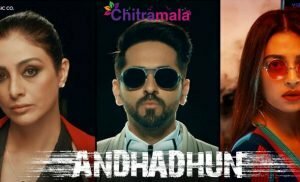 The rest of the film deals with Sarjit and Preet’s efforts in the investigation and also Shahid’s and Alia’s battle to escape from the respective mess they got into. The movie is definitely much-needed and shall be an eye opener for the awareness. A strong message that has to be conveyed to the youth. 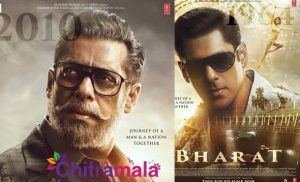 Abhishek Chaubey seemed to be very honest in his intentions and it shows. He with his art and conviction conveyed the seriousness of the issue. Past the interval, the movie takes lot of time to get back to interesting mode. Shahid was phenomenal. His screen presence was fiery. Kareena was pleasant as the doctor and very convincing. The Punjabi actor was also impressive. Alia looked out of the place and the Bihari accent and her acting seemed artificial. She is one of the major drawbacks to the film. All in all, Udta Punjab is a serious film that deserves a watch to get an awareness of the dark world.